Multitester tested for voltage.Genuine factory ORIGINAL HP power supply with AC input: 100-240V and DC output: +32V 625mA. Triple round barrel PURPLE connector. 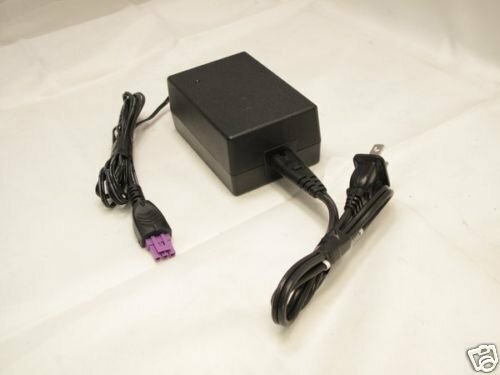 Hewlett Packard adaptor, adapter, transformer, powersupply, power supply, iscompatible forthe following: OfficeJet J4000 J4580 and many more. Please determine compatibility before purchase.S&H in the contiguous USA is $5. (insured shipping).Please see other interesting items by JGritUSPS DELIVERY TIME: As stated in the item listing, seller will drop-off your item to the USPS within 4 days of receiving cleared payment. How long it takes to deliver to your door is strictlywithinUSPS control and not within the control of seller. Please leave 5 stars for seller 4 day drop-off time. Thankyou.